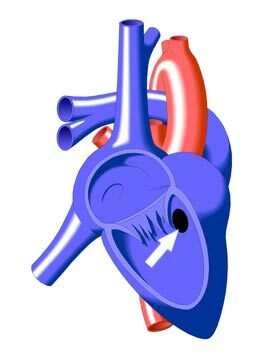 A Ventricular Septal Defect (VSD) is a hole in the ventricular septum - the muscular wall that separates the right and left ventricles, or main pumping chambers, of the heart. This opening allows the movement, or "shunting," of blood between the ventricles. Most commonly, oxygenated blood from the left ventricle enters the right ventricle because there is greater pressure in the left ventricle and the resistance in the lungs is significantly lower than in the body tissues. This is known as a "left to right shunt." Ventricular septal defects are the most common forms of congenital heart disease, accounting for 21% of all cases. They may be single or multiple and may occur in different parts of the ventricular septum.